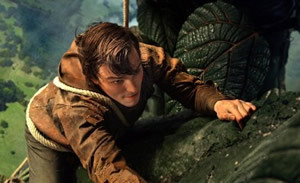 Jack the Giant Slayer is an old-school fairy tale told with modern sensibilities. Lurking under the gloss of extravagant CGI effects and a tongue-in-cheek sense of humor is a smart and savvy story about two kids raised in the same country, but worlds apart. A long time ago Erik the Great (or, as he’s known to the giants he cast away, Erik the Terrible) lived a life of high adventure. The truth of his life became legend over time, morphing into the stuff of fairy tales and bedtime stories eagerly consumed by both a humble country farm boy and an ambitious worldly princess. He is easily distracted and his mind tends to wander; she’s perfect leader material and she yearns for her own adventures. As the movie begins, the stories of their divergent childhoods are told in parallel, perfectly setting the stage for what’s to follow. Having chopped away at a giant beanstalk, Erik the Great left the giants stranded between Heaven and Earth, their sole access to Earth having fallen out of their reach. That’s the story read to Jack (Nicholas Hoult, Warm Bodies) and Isabelle (Eleanor Tomlinson, Alice in Wonderland) and it’s the story that sets the stage for the giants to seek their revenge (they want to eat the last of Erik’s kin), Jack to learn responsibility, and Isabelle to have her grand adventure. The problems, as problems so often do, start small. A small handful of beans capable of growing into another stalk reaching to the giants’ purgatory are in the process of being smuggled to an abbey by a monk desperate to keep them out of the wrong hands. And those wrong hands belong to Isabelle’s husband-in-waiting, a chilly man named Roderick (a fully-coiffed Stanley Tucci, Captain America: The First Avenger). Roderick’s more interested in Isabelle’s access to the thrown than her own finer assets. Into the thick of this smuggling mission steps Jack, who unwittingly takes the beans and is warned to not let them get wet. Great timing. A major storm sweeps across the country and those small problems get much bigger mighty fast. Enthralled by tales of King Erik, whose legend has been spun with a fanciful air akin to Malory’s King Arthur, Isabelle wants to live beyond the trappings of royal fineries. Her mother is onboard with that notion and encourages her to have her adventures and see how the world works. Doing so, Mother advises, would help her make the world a better place when she becomes queen. Therein is a certain level of smarts suitably fitting in the genre of modernly-spun fairy tales. It’s also pleasantly surprising to hear dialogue between Jack and Isabelle in which he refers to his wayward adventures and she asks if he’s referring to adventures in books or in life. She goes on to explain to Jack that she’s not running away from anything; she’s running toward something but she isn’t quite sure what it is. Alas, one knock against the storyline is Isabelle’s ultimate relegation to the role of damsel in distress. But, in a sense, it’s similar to another strong-willed princess, one named Leia, and this movie’s Jack and Isabelle hold a chemistry strikingly reminiscent of Luke and Leia back in Star Wars: Episode VI. Jack and Isabelle are both young and attractive and they’re both likable. Recently Hansel & Gretel got an update, but, for better or worse, it went for schlock and chose to splatter its brains across the screen. Last year, it was Snow White’s turn and that one would rate about on par with this version of Jack and the Beanstalk. While Snow White and the Huntsman played things straight – perhaps a little too straight – Jack the Giant Slayer slips in a devilish Shrek-like sense of humor that finds an agreeable level of irreverence to fit in among the heroics. Visually, Jack is a stunning piece of work and there are some flourishes which evoke thoughts of Monty Python, or at least Terry Gilliam. A perfect example of those visuals – and Shrek-ish humor – is found in a scene involving a giant chef picking his nose while preparing a tray full of pigs-in-a-blanket - along with a human-in-a-blanket. Part of the fun of this movie is that it’s made by a load of people already familiar with the territory. It’s directed by Bryan Singer, known so well for The Usual Suspects and X-Men and often knocked for bringing the Man of Steel down to Earth in Superman Returns. There’s also a coterie of writers that includes Darren Lemke (Shrek Forever After) and Christopher McQuarrie (who collaborated with Singer on The Usual Suspects and Valkyrie). With comic book heroes now in perpetual, rapid-release movie mode, it’s nice to go back to those old fairy tales and see how they stack up against the furious pacing and sensibilities of the current super hero tent poles. For the most part, those fairy tales hold their own quite well and serve the cause of reminding people of old-school notions such as valor and honor.